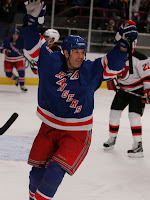 I was at the game last night at the Garden and yet again, the Rangers put the boot to the Devils, 3-2. Nigel Dawes, who was flattened by a Devil defenseman, slid on his back toward Marty Brodeur. During this turn of events, the puck had rebounded off of Brodeur into Dawes then went into the net giving the Rangers the 3-2 that they would not relinquish. Some may call this goal lucky - and it would be a reasonable debate. However, if you're the Devils you now stand 0-7-0 against your arch-rivals. You can argue all that you want, but if I'm a New Jersey Devil's player or fan, I don't want to see the Rangers again - including the playoffs. The Rangers have the Devil's number, at least for this season, anyway you look at it. It was a great night for me on a personal level. I met up with Steve "Sarge" Vickers and his wife JoAnne (I haven't seen her in 20+ years). I also met up with Emile Francis, his wife, Rod Gilbert, and of course Ron Greschner (I will make a post in the future about my case for his number being retired at MSG). As usual, a good time was had by all. That's all I got for you all this time around. Check back later in the week for a new entry as well as in the immediate future for some New York Ranger updates. The stretch run is upon us! 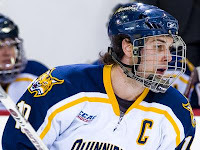 The Quinnipiac Bobcats' season ended on Sunday, 3-1 at Harvard - concluding a hard fought 3 game series. The Bobcats had overcome an 11-0 pasting Friday night in which everything that could go wrong, did go wrong. However, the Bobcats showed why hockey is the great game that it is by getting up off the ice with a wonderful 7-4 effort on Saturday night to tie the series at 1-1. Going into game 3, I felt it was going to be a typical tight checking affair. Unfortunately for the Bobcats, a shorthanded goal and a powerplay goal by Harvard was enough to clinch the series in their favor. Harvard also added an empty net goal to advance to the ECAC semi-finals at Albany, NY. It was a tough ending for the Bobcats, however the players fought right to the end (a great feat considering the 11-0 loss in game 1). They showed heart, guts, and were determined to prove themselves - and they did. In closing, it's sad for the graduating seniors not to go out on top - but they have left the team in good hands. The future, I believe, could only get better for the Bobcats, the university, and the coaching staff. I just finished the weekend at Quinnipiac University where I work part-time as a color analyst for the university's men's hockey team. 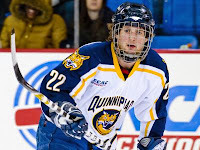 It was the beginning of the always tough ECAC Playoffs and the Bobcats were getting ready to square off against the Brown University Bears in a best of 3 series (whom were defeated twice at the hands of Quinnipiac in the regular season). The first game was played on Friday (March 7th, 2008) night at the TD Bank North Sports Center. If you were there you were treated to a wild, crazy, and unbelievable night of hockey. The Brown Bears played what I call a "Perfect Road Period". They were quicker, faster, and had great goaltending by Dan Rosen in the 1st. The Bears took a lead going into the 2nd period on a goal by Sean Muncy. However, in the 2nd it all changed as the Bobcats goal barrage began. Brandon Wong, Ben Nelson (twice), and Bryan Leetch (twice, just like Nelson) scored goals in what seemed like a machine gun fire fashion (5 goals in the matter of 4 minutes and 12 seconds). This goal barrage ended the night for Brown goalie Dan Rosen, who had a stellar 1st period. From this point, the obvious fan would believe that the game was over and done with - with the Bobcats up by a score of 5-1. However, you must remember that this is hockey and there was still plenty of time left. The Brown Bears used the Bobcats undisciplined and quite frankly "dumb" penalties to crawl back into the game with their power play - which led to 2 goals in a row for the Bears. 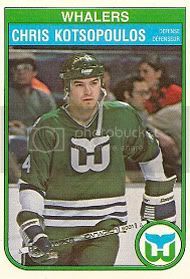 But, in response, the Bobcats' Jamie Bates fired back the what I thought "game clinching" goal late in the 2nd period for a 6-3 lead heading into the 3rd and final period of play. Boy, I was wrong. The Bobcats continued to play undisciplined hockey and Brown scored 2 more goals. The first goal was scored on a power play and the second was scored on the tail-end of the power play (which to me, is basically a power play - as soon as the player steps out of the penalty box onto the ice). Now, down by 1 the Brown Bears pulled their goalie and tried to tie the game up to send it to OT. After pulling their goalie there was a great veteran move made by Brown defenseman and team captain Sean Hurley. Hurley labored to get the puck as it just passed the red line (*Wink, wink* He knew what he was doing - definitely a heady play by a veteran). There was a icing call, which in my opinion should not of been, that ultimately led to a face-off in the Bobcats end. Shortly after the face-off, Brown pulled off the sensational comeback when Jeff Prough slammed one into the net with 5.4 seconds left to go in regulation to tie the game at 6. Going into the OT session I had some thoughts looming in my mind. Thoughts of the potential defeat of Quinnipiac. If somehow the Bobcats lost this game, they may have never been able to recover from such a heartbreaking defeat the next day. This obviously would have heightened Brown's chances in the playoff series as they both had the momentum and confidence to "seal the deal". However, on this wild and crazy night where 12 goals had been scored already, the Bobcats showed why hockey is and always will be the most exciting sport there is. David Marshall made a great move (off of the rebound from a shot by Eric Lampe) and scored the game winning goal at 11:58 left in the OT session. It was one of the craziest games I have ever seen, let alone done the color commentary for on the radio. It had just about everything you could imagine, both good and bad. The bad is that if you were not there; explaining and writing does not do it the proper justice. You had to see it to believe it! The Quinnipiac Bobcats showed why sometimes the regular season means very little - if anything at all. Losers of 6 straight entering post-season play, the Bobcats swept past a gritty, well coached, yet under talented Brown Bears squad. The Bobcats move into the 2nd round of the ECAC Playoffs after clinching the best of 3 series with a 7-6 OT victory on Friday night followed by an astounding 7-1 victory the following night. My next post will go into greater detail of the amazing 7-6 OT victory over the Brown Bears. The New York Rangers took it on the chin Tuesday night in a 6 round shootout against the New York Islanders. Jeff Tambellini finished the Rangers off with a quick wrist shot past Henrik Lundqvist, which sent the Ranger faithful scurrying to the exits. I was at the game and I had that eerie feeling early in the 1st period when the Rangers were unable to capitalize on numerous chances. You could just feel it. The Rangers out chanced and outplayed the Islanders by a wide margin, but found themselves down by a goal at the end of the 1st period. My early personal feelings proved prophetic as the Rangers played the role of chasing the Islanders the rest of the way. I have played in many games like this and it's a terrible feeling on the bench, you know you should be winning but it's not happening. Sometimes as a team you win games you should lose and sometimes you lose games you should win. 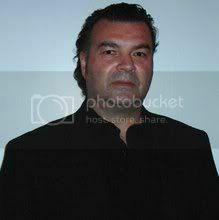 I really don't want to dwell too much on one game, however I must tip my hat to the Islanders - especially backup goaltender Wade Dubielewicz (Boy thats almost as tough to spell as my last name). 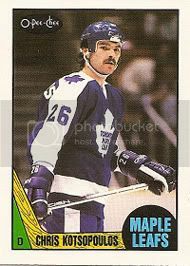 Who was a surprise starter in place of Rick DiPietro. In the end the Rangers salvage a point so all is not lost. Points down the stretch run to the playoffs are like gold. On the personal side, it was really great meeting up with former teammate Ron Greschner. 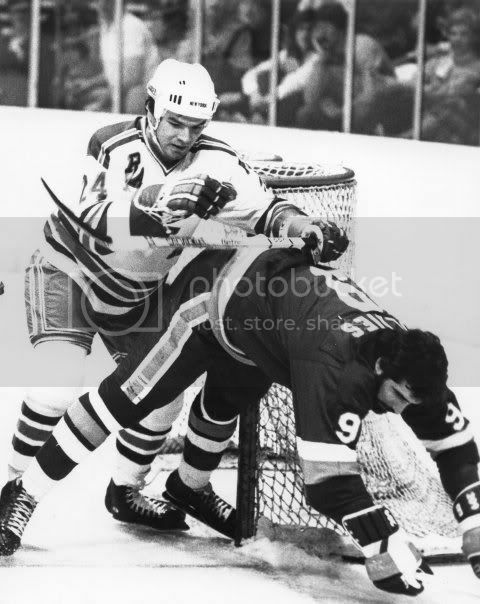 "Gresch" is and always will be one of the truly great Rangers of all-time. Ron is as genuine a person you'll ever meet. I will always consider it a privilege to have played with Ron and to be able to call him my friend. 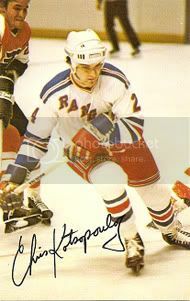 In the future I will delve into the reasons for Ron's jersey to be retired and hung up with the other legendary Rangers at MSG. The other interesting part of the night was it looked like a "Sopranos" reunion at the Garden. There were too many to name, but it felt like the whole cast was in and around the building. 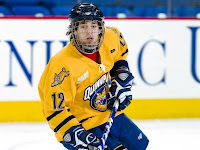 I will be away this weekend doing radio for the Quinnipiac Bobcats (Quinnipiac University). Please check back, I will be talking hockey more and more in the future.